To set up your hardware signal path, connect Pro40 outputs 3 & 4 to the left and right inputs of your external hardware. Then, connect the left and right outputs of your external hardware to Pro40 inputs 3 & 4. 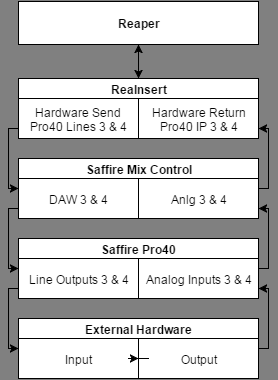 Open Saffire Mix Control. 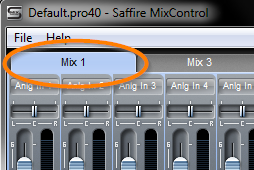 Before you make any alterations, save the state of your Mix Control Profile by going to ‘File -> Save or Save as. . .’ and save your current setup to a new or existing name. When you’re finished with this tutorial, you’ll be able to undo your routing changes by going to ‘File -> Open’, and loading your original setup. This is a handy tool to instantly recall any setup specific to a session or use. Make sure you’re in ‘Mix 1’ by checking that the ‘Mix 1’ tab is selected. Click the stereo link button between tracks 3 and 4 to lock the volumes together in the internal mixer. 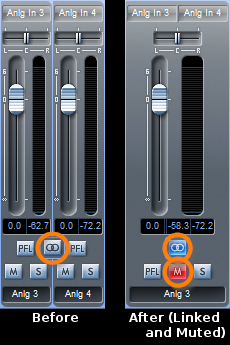 Also, mute the linked channel; otherwise you’ll hear two out of sync feeds of your processed audio on ‘Anlg In 3 & 4’. Then, in the output routing section below the mixer, click on the grey box to the left of ‘Line Output 3’ and select ‘DAW -> DAW 3‘ from the dropdown menu. 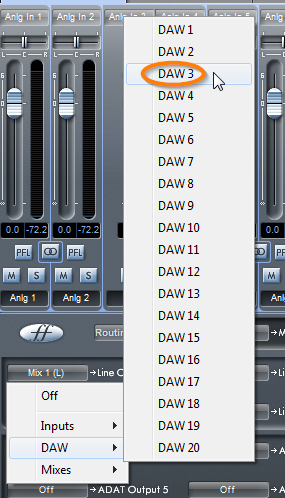 Select ‘DAW – DAW 4’ for ‘Line Output 4’ the same way. Now your Pro40 is configured to accept a paired input on Analog Inputs 3 and 4 and pushing anything it receives from DAW channels 3 and 4 out though Line Outputs 3 and 4. If you’re not using the default MixControl configuration and/or already have equipment on inputs 3 & 4 or outputs 3 & 4, any pair of inputs or outputs will work. Just be aware that the walkthrough is going to refer to inputs 3 & 4 and outputs 3 & 4 exclusively for the sake of simplicity. If you’ve chosen differently, make sure you substitute ‘whichever input/output you chose’ whenever the walkthrough refers to ‘inputs/outputs 3 & 4’. For further information on how to navigate custom setups and saving/opening configuration files, consult the Pro40 user manual. By default, Reaper does not make use of every input and output of the Pro40. Unless you’ve altered your preferences, Reaper will automatically choose a minimal set of inputs and outputs to save the CPU from working unnecessarily. Check that Reaper is accepting and transmitting on all the channels you’ll be using by going to ‘Options -> Preferences’ and selecting the ‘Devices’ sub-heading in the ‘Audio’ section. 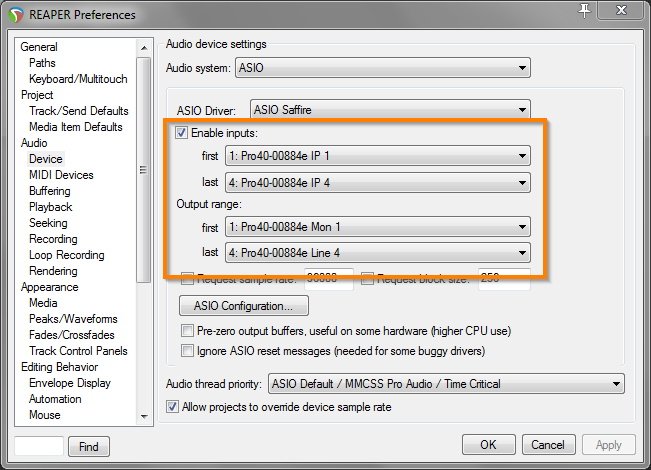 Make sure that you have ‘Enable inputs’ checked, that your first input is ‘1: Pro40 IP1‘, and that your last input is set to at least ‘4: Pro40 IP4‘. In the ‘Output range‘ set the first to ‘1: Pro40 Mon1‘ and the last to at least ‘4: Pro40 Line4‘. Once your preferences are in order, find the track you’d like to run through your external gear. Click on the FX button, click ‘Add’, and select ‘ReaInsert’ from the plugin library. Routing a track through external hardware can be done without it, but ReaInsert is made specifically to route audio to and from a hardware device. In the ‘Hardware Send’ section of ReaInsert, set the ‘Left’ to ‘Pro40 Line 3‘ and the ‘Right’ to ‘Pro40 Line 4‘. Below, in the ‘Hardware Return’ section, set the Left to ‘Pro40 IP3‘ and Right to ‘Pro40 IP4‘. At this point, Reaper is sending audio via ReaInsert out to DAW 3 & 4. Mix Control is taking output from DAW 3 & 4 and routing it to Pro40 Outputs 3 & 4. which are connected to your External Hardware. Your External Hardware processes the audio and sends it back to the Pro40 via inputs 3 & 4. ReaInsert captures inputs 3 & 4 and routes them back into your track in Reaper. Press play and adjust the gain for inputs and 4 the Pro40 and on your external hardware until you’ve got a signal you’re happy with. Congrats! You’ve routed audio in the box through an external piece of gear. You won’t be able to record this track normally, as a track can’t record it’s own output. Add a new track with Ctrl-t. Then, click the routing button to the right of the track name on the new track. In the ‘Receive’ section, click on ‘Add New Receive. . .’ and select the track you’d like to record from the dropdown menu. Then, click the record selection button on the new track and set it to ‘Record: Output -> record: output (stereo, latency compensated)’. Arm the track for recording and press record. Because the same audio is coming through both the outgoing and the incoming track, your output will be twice as loud, so be sure to turn down your master bus, headphones, or monitors. Alternately, you can prevent the new track from reaching the master bus by clicking the routing button and unchecking the ‘Master/parent send’ checkbox. Decoding the audio going out to your external hardware and re-encoding it on the way back in takes time and would cause your bumped track to sound slightly behind the rest of your tracks if ReaInsert didn’t automatically make latency adjustments. In order to line everything up, ReaInsert tells Reaper to delay the output of every other track by the amount of latency it detects, which means your bumped track will play in sync with everything else. This won’t make a difference for most applications, but if you’re going to be doing any timed tweaks on your external device (sweeping a low filter pass at certain points in the music, for example) you won’t hear your changes in real time. If you need to hear and record your performance tweaks on your external gear in real time, you can do so with a few adjustments. 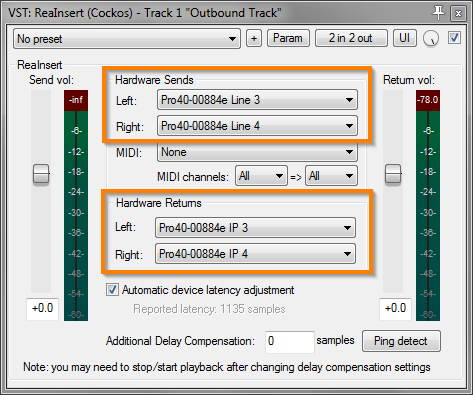 Click the effects button in the original track, select ReaInsert, and uncheck ‘Automatic Device Latency Adjustment’. Next, uncheck the ‘Master/parent send’ boxes in both your original track and the new track you’d created to record your processed audio. Then, switch over to Mix Control and unmute the inputs for ‘Anlg In 3 & 4’. By doing this, you’ve silenced the slow, post-encoded audio, and un-muted the live, pre-encoded audio. This is why, earlier on in the section on setting up Mix Control this walkthrough asked you to mute the audio coming in on channels 3 & 4. If you hadn’t, you’d have heard two feeds of the exact same audio, but out of sync with each other. When you’ve got the take you like, re-check the ‘Master/parent send’ checkboxes in Reaper and mute ‘Anlg 3 & 4’ in Mix Control. Once you’ve got everything working, switch over to Mix Control and save your routing choices by going to ‘File -> Save As . . .’ Pick a name like ‘loopback on 3-4’ or something you’ll remember and save. Next time you’d like to loop through an external device, you’ll be able to jump straight to this setup by going to ‘File -> Open . . .’ and selecting this Pro40 file. Thanks for reading. If you have any questions or need clarifications, please use the comments section! If I am using outboard gear to process a stereo track and only need to hear the processed audio and none of the original, how do I set it up? Thanks for this post it has been incredibly helpful! This setup should result in exactly that; just hearing the output of your process (not your input). Are you hearing both after setting up via his guide?